The European Aviation Safety Agency (EASA) has released the first formal Opinion on the safe operating of small drones in Europe and which will become an important stepping-stone to the building of a wider regulatory framework and a means to keep drone operations safe. This Opinion will act as a platform on which the European Commission can adopt regulatory proposals later on in the year. The European Commission has already chaired a meeting with EU Member States on February 21. The EASA has provided an innovative means for the regulation of drone operations where rules are simplified, and focus is mainly on the risks associated with a drone’s operation – for example the risk associated would be greater flying the same drone in a built up residential area as opposed to open fields. The Opinion is also charting new territory where aviation and product legislation are combined: design requirements for small drones (up to 25kg) will be implemented by using the well-known CE (Conformité Européenne) marking for products marketed in Europe. Each drone will be come with a package a consumer information with the “do’s and don’ts” on how to fly a drone without endangering other members of the public. 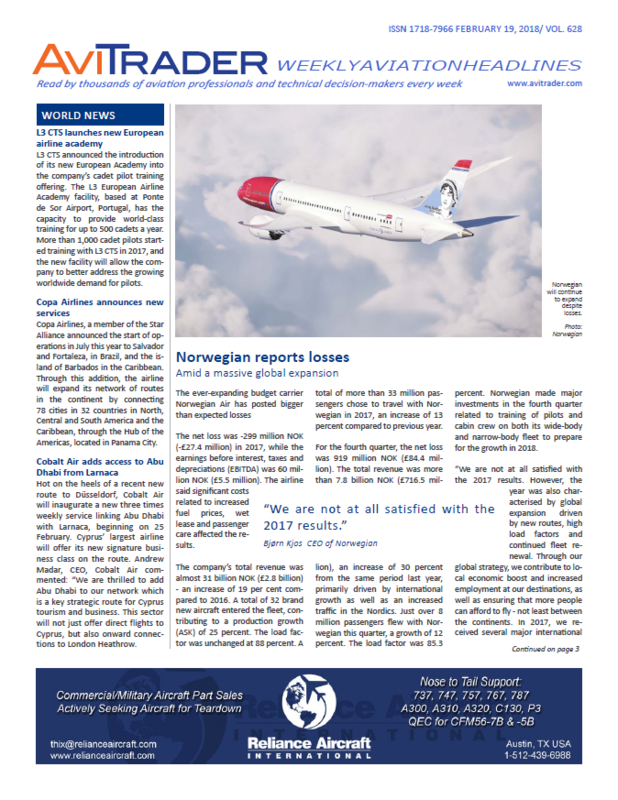 This Opinion follows a preceding consultation document (Notice of Proposed Amendment - published by EASA in May 2017) and takes into account thousands of comments received from private citizens, industry, operators and national authorities obtained during a four-month public consultation period. Flydubai has reported its Full-Year Results for the year ending 31 December 2017. flydubai reported total revenue of AED 5.5bn (US$1.5bn) compared to AED 5bn (US$1.37bn) last year; an increase of 9.2% compared to the same period reported in last year’s results. The airline reported a profit of AED 37.3m (US$10.1m) for the full year 2017; the airline has continuously reported Full-Year profitability since 2012. Flydubai carried 10.9 million passengers – a record number for the airline. Passenger numbers grew by 5.5% compared to the previous year. With up to 295 aircraft on order flydubai becomes one of the world’s top ten airlines in terms of order backlog. Aviation Capital Group (ACG) has taken delivery of its first Boeing 787 Dreamliner in Everett, Washington. The aircraft, a Boeing 787-9, is on a long-term lease to EL AL Israel Airlines, and is the first of two Boeing 787-9’s to be delivered from ACG’s orderbook and leased to EL AL Israel Airlines. The second aircraft is scheduled to deliver this fall. “We are pleased to embark the first delivery of the new Boing 787-9 from ACG. The anticipated arrival of the new 787 aircraft marks a revolution in the customer’s flight experience. We set a high standard of service and product excellence in order to retain our standing as the first and preferred choice airline for travelers to and from Israel,” said new CEO of EL AL, Gonen Usishkin. Avolon, the international aircraft leasing company, has released results for the 2017 full year. The year was headlined by the acquisition and integration of CIT’s aircraft leasing business. Avolon’s owned, managed and committed fleet grew 109% in 2017 to 908 aircraft by year-end and full year profit after tax increased 59% to US$550m. Avolon reported 107 aircraft deliveries, transitions and sales, including the delivery of 45 new aircraft. The company sold 44 aircraft, including 29 owned aircraft and 15 managed aircraft, across the combined platform in 2017. Owned, managed and committed fleet increased by 109% year-on-year to 908 aircraft at the end of 2017. The average age of its owned fleet was 5.3 years, and the average remaining lease term of its delivered fleet was 6.6 years. Fleet utilisation for the year was 99.4%. Safran and Albany have inaugurated a third joint manufacturing plant in Mexico, to make composite parts for the LEAP aircraft engine. This third joint plant is similar to and complements the two existing plants in Rochester, New Hampshire (United States), and Commercy (eastern France), inaugurated in 2014. It involved a total investment of about US$100m and delivered its first parts in October 2017, primarily making 3D woven composite fan blades for the LEAP engine from CFM International. As the LEAP program develops, this plant will also make guide vanes. The investment needed to add this capability will start this year, with delivery of the first parts expected in January 2019. The new joint Safran/Albany plant in Mexico currently has nearly 230 employees, operating in a facility with 31,000 m² (334,800 ft²) of floorspace. The total workforce is expected to reach nearly 600 by 2021, to handle annual production of more than 20,000 composite blades and 31,000 outlet guide vanes. Located in the Querétaro Aerospace Park, this newest plant benefits from its proximity to other facilities, including Safran Aircraft Engines Mexico and Albany's Machine Clothing plant in Cautitlan. Safran and Albany have been working closely together for nearly 20 years. Through this high value-added partnership, they have developed the 3D RTM (resin transfer molding) process used to produce fan blades and cases for the LEAP engine. The use of 3D woven composites makes a significant contribution to the LEAP's performance, since it offers 15% lower fuel consumption and CO2 (carbon dioxide) emissions than previous-generation engines. The construction of the new Safran/Albany plant in Mexico was announced in 2016 to support the ramp-up in LEAP production, which should reach a peak rate of more than 2,000 engines per year in 2020. Having already recorded over 14,000 orders and commitments. Today, more than 210 LEAP-1A and LEAP-1B-powered airplanes are deployed by 33 operators on five continents, and they have already logged over 610,000 flight-hours and nearly 300,000 cycles. Pratt & Whitney has released a revised configuration as a solution to the issue relating to a knife edge seal on the High Pressure Compressor (HPC) aft hub which affected a limited sub-population of the PW1100G-JM engine that powers the Airbus A320neo aircraft. The solution is based on a design with which the company has significant experience, and this solution has received all necessary regulatory approvals. Pratt & Whitney has begun implementing this solution and production engine deliveries incorporating this change will begin in early March. The company will continue to work with Airbus and its mutual airline customers to minimize operational disruption. Honeywell has signed a five-year contract with Bristow Helicopters for its Honeywell Avionics Protection Plan (HAPP). The agreement will cover 26 of Bristow’s Leonardo AW139 helicopter fleet. Under the agreement, Bristow Helicopters will benefit from full maintenance protection coverage for the avionics suite of its search and rescue fleet, providing improved cost forecasting. The company will also have access to repair and parts exchange services in addition to support from Honeywell and its global network of authorized service centers to return its helicopters back to the sky quickly and efficiently. Honeywell offers a variety of maintenance contract options, allowing operators to choose the plan that best meets their requirements for exchange and repair services. HAPP also provides coverage on all Honeywell avionics systems across civil service rotary fleets, as well as commercial and business helicopters. Bristow Helicopters provides industrial aviation services, including offshore transportation, search and rescue, and support services. The addition of HAPP expands on the relationship between the two companies, with Honeywell’s Sky Connect flight data monitoring system already in use across Bristow’s fleet. Independent MRO provider Monarch Aircraft Engineering (MAEL), has won an expanded maintenance commitment from Icelandair. Icelandair, which has been a MAEL customer since 2003, has increased its current maintenance commitment to include base maintenance for a fifth aircraft – a Boeing 757 heavy check to take place at MAEL’s Luton facility. MAEL has carried out a check for Icelandair’s B757 freighter aircraft last November and currently has the second of three planned B767-300 aircraft in maintenance at its Luton facility. 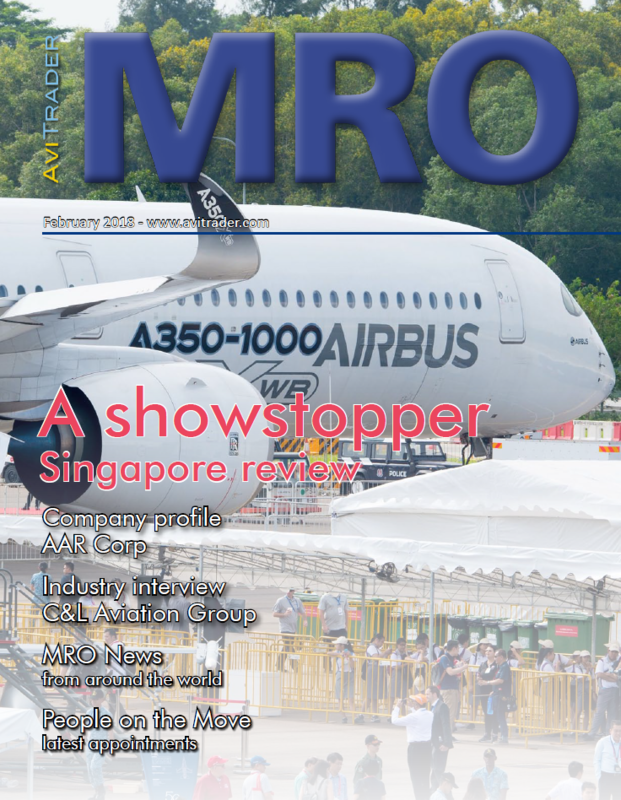 Since becoming an independent MRO provider in October 2017, MAEL has announced a wide range of new agreements with airlines. In addition to Icelandair, these include Virgin Atlantic Airways, China Airlines, Wizz Air and La Compagnie. SR Technics is partnering with Invert Robotics to implement an innovative robotics solution to enhance its aircraft maintenance inspections. Developed by Invert Robotics, the robot employs a patented mechanism that explores the airframe surface to assess the required maintenance needs. Equipped with a high-resolution inspection camera, the robot records and transmits video images to a ground-based screen, which are then analyzed by SR Technics engineers. The use of this new solution enables efficient visual inspections both on the tarmac as well as in the hangar. In addition, the inspection images can be used for more detailed repair assessments and as a record of the current state of the aircraft for future comparisons. The automated inspections can help reduce the inspection time from hours to minutes. Furthermore, the robot's capabilities can be enhanced by adding functions such as ultra-sound and thermographic testing that allow robots to perform many labor-intensive and tedious maintenance inspection processes more efficiently. Freeing up skilled aircraft engineers to manage more complex tasks helps speeding the process, and reducing cost of the overall maintenance process. Morten Beyer & Agnew (mba), a consulting leader in the aviation industry, has promoted Lindsey Webster from Director to Vice President of Asset Valuations. In this role, Ms. Webster will lead a team of ISTAT Certified Appraisers in valuing aircraft, spare parts, engines and helicopters. Ms. Webster will also perform industry research and economic analysis, model value trends, and forecast future asset values and economic lives. Ms. Webster will be responsible for the management of mba's European office in addition to heading the US asset valuations team. Ms. Webster is an ISTAT Certified Appraiser with a Bachelor of Science degree in Finance and Insurance from Northeastern University. Prior to joining mba, Ms. Webster worked in Fixed Income at Lehman Brothers and in Corporate Sales with the Ritz-Carlton.